Atlanta’s venerable Coca-Cola Company is celebrating its 125th anniversary this year. From a flavorful pick-me-up concocted by a local pharmacist, Coca-Cola has become the world’s best-known consumer product. 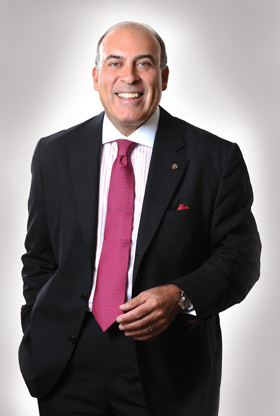 Muhtar Kent became CEO in 2008 and added the Chairman of the Board title in 2009, succeeding such civic and corporate icons as Robert Woodruff and Roberto Goizueta. Kent talked to Georgia Trend’s Neely Young and Susan Percy at the Coke headquarters in Atlanta, the day after he returned from southern Russia, where he opened a new plant. Following is an edited version of the interview. GT: How do you describe Coca-Cola? Kent: Coca-Cola is simple moments of pleasure, invited into people’s lives more than 1.7 billion times a day. That is what Coca-Cola is. It started from a wonderful idea, just a block away from here 125 years ago. I think the success of Coca-Cola is not a testimony to its age but its youth. I always say we’re 125 years young, not 125 years old, because we intend to be around another 125 years and more. Coca-Cola is the greatest idea in the world that brings people together. GT: How has being in Atlanta helped shape the company? Kent: Atlanta is a wonderful city. I came here to start work in 1978. Atlanta has always been a great crossroads, a great diverse city where a lot of great ideas started as Coca-Cola did. The people of Georgia [are] warm, always welcoming, always sharing. I think that’s a great thing, for us to be proudly employing 9,000 or more associates here in Georgia, investing in Georgia, growing in Georgia and growing with Georgia. It’s a wonderful thing to be headquartered here in Atlanta. We’ve called Atlanta home for 125 years and will continue to do so. We have always been associated with Atlanta – much more than just a business association – and Georgia. GT: Certainly Coca-Cola has played a part in shaping Atlanta, too – perhaps most famously through Robert Woodruff. Kent: Not only Robert Woodruff, but for sure Robert Woodruff, who did so much for the city and Coca-Cola and so much for the world – taking Coca-Cola international, making it available for a nickel to every U.S. soldier who was stationed overseas [during World War II]. He’s not only a great icon of business but also of civil society. All the philanthropic work he has done, leading America in that kind of giving that makes America unique to all other countries of the world. We are the biggest giving country. No other nation of the world gives as much as America proportionally or on an individual basis. We give $300 billion [a year] in this country. And Robert Woodruff led the way, showed how that could be done effectively, through foundations, what he did for Emory, the city, Woodruff Arts Center. GT: Would you talk about the global scope of the company? Kent: Let me preface that by saying we have been focused on growth also here in the U.S., so we don’t think of growth overseas at the expense of not expanding here in the U.S. Two or three years ago [when] we talked of growth in the U.S., people thought I was trying to go to the moon in a glider and wondered how will that happen. Coca-Cola had not been generating growth in the U.S. for quite a while. We now have shown, quarter after quarter for five or six or seven quarters, that we can grow in the U.S. In this environment, the world that we’re in – somewhat of a challenging environment – I think everyone, individually, businesswise, politicians, policymakers, collectively we all have to crack the code for growth. Growth is key to jobs. The thing we need most today is jobs, jobs, jobs to bring unemployment down. Here in the United States, in Europe, Japan, everywhere around the world there’s unemployment, there’s social injustice. More employment will create less injustice, more justice. We all have a role to play. We at Coca-Cola invest here in the U.S. We’re growing our business, we’re creating more jobs, and we’re also investing overseas. We have a magnificent dynamic footprint of nonalcoholic beverages around the world. We lead in most categories of nonalcoholic beverages, and we’re proud to do so. We provide not just refreshment, but moments of pleasure and hydration to people a billion times every day. GT: How has the beverage business changed since you joined Coca-Cola in 1978? Kent: Consumers have changed – that’s the first and most important thing. Consumers have become more empowered. Consumers have much more information. (There are four billion cellphones in the world as compared to three billion toothbrushes.) Consumers are dictating what they want, how they want it, what packaging they want, where they want it and what price they will pay for it. We need to be always in the process of renewal and be ahead of their tastes. In ’78 we probably had somewhere in the range of 15 brands, maybe 30 products around the world, and today we have 3,000 products, 500 brands. We have evolved [by] catering to those changes, evolved into more categories – teas, coffees, sports drinks, water, vitamin water, enhanced water, energy drinks. In addition to making sure we continue to create vibrant, inspirational communication with our core brands – Coca-Cola, Fanta, Sprite, – we brought out more calorie-free beverages, giving consumers more choice, much more proactive information about our products, calorie information, front-of-pack labeling. Also [by] taking many policy decisions globally – marketing our beverages with guidelines, voluntary measures like not marketing to children under 12, more innovation in our packages to make sure consumers have the right amount of information to make the right choice. The world is changing at an increasing pace. We always fit more change into fewer years. To the extent that Coca-Cola can be ahead of that change, can lead the innovation and at the same time respect its heritage, learning from its heritage and leading the change – that’s the key to success. GT: How has your advertising changed? Kent: Back in the ’70s and ’80s, 100 percent of dynamic media marketing was geared toward television, radio, those kinds of channels. Today, more than 25 percent goes to social media. We have 30-plus million people on our Facebook page – the largest number for any brand in the world. It’s no longer about creating consumer impressions, but creating consumer expressions. GT: Coca-Cola has always been protective of its brand. Kent: Protection of brands is one way to phrase it, but a better way for me is that we nurture and build our brands and ensure that our brands remain healthy, vibrant inspirations to all our consumers. It’s not about what’s in a brand, it’s a matter of what is perceived by our consumers about our brand. It’s about consumer expressions, positive consumer expressions. These days when social media have become so important – it’s not what we say about our brand that is so important, [it’s] what people say, what consumers say about our brand that is important and how that gets around. Social media travel at the speed of light. Social media channels are critical to succeeding in the 21st century with marketing, as a brand company, as a brand business. We are only as healthy and successful as our brands are, to the extent that brands remain vibrant and inspirational. GT: Many of our readers very likely have Coca-Cola stock in their portfolios. What would you say to them about their investment? Kent: I would thank them first for their trust in Coca-Cola – all of your readers who own Coca-Cola stock and traditionally have owned Coca-Cola stock, great families from the South and Georgia who have owned Coca-Cola. I thank them for their trust in our leadership and our company. Not just me, but there is a great team around the world of men and women that care for their investments. Every day they wake up and they’re inspired by this great company, this great brand, this great business. Success for a company today is not just based on business principles but also what you do for the communities around the world where you operate. Supporting sustainable communities makes it possible for us to have a sustainable business around the world. GT: Tell us about your sustainability efforts. Kent: There are four pillars of sustainability that we lead in around the world. The first is water. We have announced that we will be water-neutral by 2020. As a company, we use more water than any other business, any other company in the world. Secondly, growing our business but not growing our carbon footprint around the world, [using] hybrid trucks, HFC-free cold drink equipment around the world. All our coolers now are energy efficient. [We] use much less energy, don’t produce gases that deplete the ozone. Third is packaging and recycling. That is why we introduced a “plant” bottle for the first time – a bottle that’s made partially out of waste of sugar cane instead of fossil fuels. Fourth is supporting communities. I’d like to tell all your readers who own Coca-Cola stock that their company is foremost in sustainability. Only then can a business be successful when you are helping create sustainable communities. Sustainable is no longer [just a] good word in our business, but it’s core to how we do things. Just like that plant bottle – soon that plant bottle is going to cost us less than a normal bottle. You actually do good but at same time you do well. GT: Would you talk about the nutritional aspects of Coca-Cola and its products? Kent: We find ourselves in this incredible juxtaposition in the world in the Coca-Cola system. We have to be part of the solution in the world. We’re not the cause at all, but [have to be] part of the solution for over-nutrition and also for malnutrition. In terms of over-nutrition, we continue to innovate and give our consumers choices, so for every one of our beverages, a core brand that has calories, we offer a choice of no calories. Then we need to raise awareness – we’re a marketing company. We can raise awareness for energy, balance, [and an] active healthy lifestyle. We have a role to play but we can’t do it alone – governments, civil societies, NGOs [non-governmental or-ganizations] that we work with and business have to come together in this golden triangle, have to come together to find solutions for over-nutrition. In vast parts of the world where we operate – whether it’s Latin America, Asia, the Philippines – we have programs with great NGO partners, where we innovate products that are of nutritional value for young children that are starting school. We distribute those products that we have designed specifically with ministries of education and health together with support from NGOs. We are proud to distribute those products [to combat] malnutrition. GT: In a recent interview with the Financial Times, you used the phrase, “algorithm for growth.” What exactly do you mean by that? Kent: A code for growth. It is incumbent upon all businesses that are small, medium-sized or large to define a way to grow in this environment. If you don’t grow, you go back; there’s no staying where you are. Individuals have to find a way to grow. You have to renew yourself, have to always learn every day, have a point of view about things that are new to us whether it is technology, whether it is politics, whether it’s the Arab Spring, whether it’s political changes, issues around terrorism, security. Everything in the world is evolving at such a fast pace, we all have to learn more, read more. Even if you’re a little kiosk selling certain things – five or 10 different categories of products – candles to candy to beverages to postcards. Those things that people want to buy from you evolve. Everybody needs to find the algorithm, the right code for growth. Only can we then bring unemployment down, only then can we create jobs when we grow. We can’t hire people if we’re not growing. GT: How can the process of job creation be accelerated? Kent: We have to learn from the lessons of Japan and can’t enter into a period of 20 years of stagflation. Policies that didn’t work for yesterday are not going to work for today. Decisions that policy-makers have taken that brought us here are not the same decisions that are going to take us out of here. There needs to be a call in the world for more coherent cooperation between business and government and public-private partnership, more investments in sustainability, infrastructure that short-term creates some jobs. Housing is not going to recover anytime soon to pull us out of this. We need to find an alternative quickly. All of us. Kent: Yes, I am. I am particularly optimistic about prospects for the U.S. because of the demographics of this country. The U.S. is unique compared to the rest of the Western world, Europe, Japan, Australia, Canada, unique in that it is the youngest population by far. By 2020, 31 percent is going to be older than 60 compared to 41 for Japan or 38 for Europe. We are a young population; we are diverse. Diversity brings better, new ideation. We are a dynamic entrepreneurial population, and we have the best educational system in the world. We have still 50 percent of immigrants who come with a university diploma, so we get the best talent in world. We are a giving nation, the best-educated nation – those are the kinds of things that give me hope for the American future. Those are great ingredients for a better future.